(Nanowerk News) NASA has selected UT Arlington as one of four U.S. institutions to develop improved methods for oxygen recovery and reuse aboard human spacecraft, a technology the agency says is crucial to "enable our human journey to Mars and beyond." 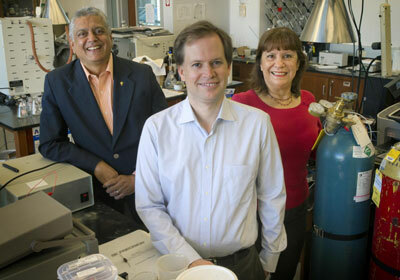 Principal investigators on the UT Arlington project are from left: Krishnan Rajeshwar, distinguished professor of chemistry and biochemistry in the College of Science; Brian Dennis, associate professor of mechanical and aerospace engineering in the College of Engineering; and Norma Tacconi, a research associate professor of chemistry and biochemistry. "These ambitious projects will enable the critical life support systems needed for us to venture further into space and explore the high frontier and are another example of how technology drives exploration," Gazarak said. NASA's full announcement is available here.